One sure way of ruining the experience of a camping trip is not getting enough sleep or waking up to a sore back. Getting enough shuteye is extremely important and one of the best ways of ensuring restful sleep is using an air mattress. Thankfully the old floppy, squeaky air mattress that were once common are no longer an issue. More outdoor companies than ever are creating inflatable sleeping pads and camping-specific air mattresses that are at home out in the backcountry. If you’ve been struggling to get good quality sleep during camping trips or know it’s time to upgrade your old air mattress, consider one of these 3 options. Therm-a-Rest is a brand owned by the Cascade Designs company. They are well known for their superior air mattresses, which are made of the highest quality materials and created with innovative designs in mind. One of their most popular lines is the NeoAir, specifically the Xlite. This is a super portable and compact air mattress that is ideal for the solo camper who wants something he/she can take anywhere. The NeoAirXlite is a super compact air mattress that is great for backpacking and camping. Once deflated and compressed into a roll within the stuff sack, it’s about the size of a 12 oz water bottle. The pad is only 2.5″ thick but inflates very well, with no worries of leaking. The baffling on the bag gives great support to the body to ensure a peaceful sleep. Despite it’s small size this mattress is very durable and is going to last for a long time. It is a true 3 season pad and is extremely warm. Therm-a-Rest used their own ThermaCapture technology on this model, which reflects heat back to the body. The additional Triangular Core Matrix greatly reduces any heat loss, despite their being no traditional insulation. The only downside to this model is the width. At only 20″ wide for the small and regular sizes, the average person isn’t going to be able to lay on the back with their arms at their sides- instead they will have to sleep with their hands on their stomach. Sizing up to a large can alleviate this problem. 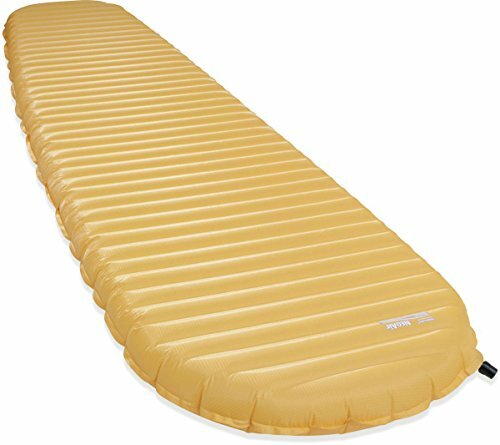 This specialized air mattress is an award winner by editors at Outdoor Gear Lab and Backpacker magazine. 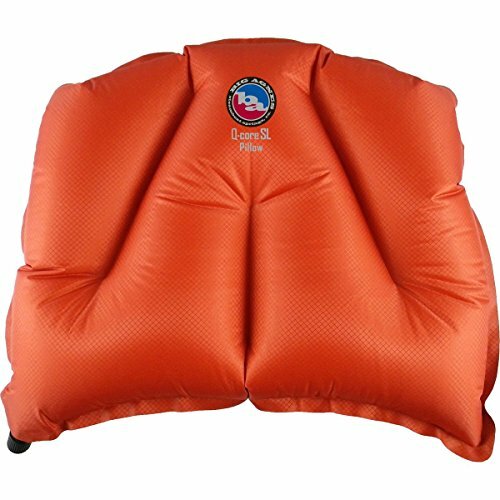 It really is an excellent all around air mattress/sleeping pad for the serious enthusiast that wants something he or she can rely to get them comfortably through the night. Sometimes camping calls for a big air mattress. Maybe you want to share the bed with your significant other or you don’t mind sharing the same mattress with a friend. Maybe you just want a nice big mattress for the kids to share. Whatever the circumstance, the REI Relax Air Bed in the queen size is the perfect solution. The Relax Air Bed is easy to inflate with the manual air pump that comes with the model, however some find that the pump is a bit loud. The mattress itself isn’t apt to leak since REI added a 1 way inflation valve. This solves the problem of worrying about air leaking while you try to inflate the mattress. There is a separate valve for deflation- which works extremely fast. Overall the mattress is quite durable. It is made of tough synthetic materials that are soft against to the touch. The baffled quilted top helps distribute weight and provide stability. The seams are also welded for even more durability and leak prevention. It isn’t particularly noisy when someone moves around, unlike other air mattresses. A downside of this mattress is that there is no insulation so you will need more bedding/more substantial sleeping bag than normal if you plan to use this model for 3 season use. Also, it’s common sense that you wouldn’t really take this model backpacking due to the weight and size- save it for car camping. If you are on a tight budget but need a bigger air mattress that is well made, this model should work perfectly for you. 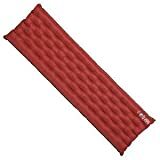 Last is the Big Agnes Insulated Q-Core. Though it may be a sleeping pad, this mini-air mattress is going to keep you just as comfortable as any true air mattress. Even though this product isn’t a true inflatable mattress, it is an inflatable sleeping pad which makes it perfect for solo campers that finds twin size air mattresses to be too big. 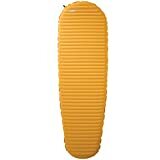 Big Agnes claims that their pads are the most comfortable on the planet and more reviews support that. This Q Core pad is one of the lightest ones they offer but it is still warm enough for 3 season use. It has an estimated R-Value of 5 and being 4″ thick, you’ll be off the cold ground. The pad is smooth and comfortable thanks to the alternating I-Beam construction. This pad is made from synthetic materials and insulated with X-Static- an insulation that has silver filaments woven in which blocks odors, is microbial by nature and thermodynamic. The top and bottom are made from a durable ripstop Nylon and the inside does have PU coating. The Q-Core is more like an air mattress in the sense that you have to inflate it by mouth rather than being self-inflating like other pads. The inflation valve is a durable brass and not prone to leaking, however some users who are heavier than average have found that light leaking does occur overnight. It can take quite a few breaths to inflate and deflates very quickly as you roll it back up for storage. Overall this air mattress-like sleeping pad is very budget friendly and perfect for the individual who doesn’t want/need the extra space a twin air mattress gives. It can also work well for backpacking as it rolls up quite compactly. Air mattresses can really improve the experience of camping. No one likes to wake up with a sore back and adding one of three 3 pieces of gear to your arsenal is going to ensure a good night’s sleep.